Welcome to the May 2005 Photo Gallery! Mike C. recently pointed out to me that we have not had a Gallery Topic devoted to rolling stock. Now I know that we have a number of members whose passion is building/detailing/weathering rolling stock, thus we need to address this oversight. So, fellow Forum Members, lets share our favorite pictures of rolling stock, both model and prototype. If it is a picture of a model, remember to mention the manufacturer and any modifications that you have made to the model. Have you been playing around with weathering rolling stock? This is the opportunity to share your efforts in this month’s Gallery. Scratchbuilders and kitbashers, jump right in. (Those members participating in the Exchange Program might want to post a few pictures here as well.) Finally, if taking prototype photos is your passion, feel free to add them to the Gallery. As always, please adhere to the following posting requirements: photo files should be no more than 80kb @ 72ppi in size - even if downloading from a remote server or website - and can be no more than 7 inches in width (to prevent viewers from having to scroll back and forth to see the entire photo or read text on the same page). Photo submissions not meeting the above requirements will be resized by the Moderator. With no further ado, let the posting begin! I bought 2 of these 8 truck monsters ( about a foot long ) from the good guys at Peach Creek Hobbys in Laurel, Maryland . John and his folks handle a lot of the steel mill equipment that I need . Thanks for starting us out with a really interesting model! Here is a night shot of an old Erie boxcar (Athearn model). Well, I guess I timed this right…right when I’ve just about finished this project, the Gallery theme this month is rolling stock! That is one awesome piece of rolling stock. I posted this before but I think it deserves posting again since it is so unusual. Here is the first prototype shot. It is a Raritan River boxcar in Quakertown, PA. Finally one of these I can contribute to! On30 16'. The tank was a gift from Marc Reusser (GL I tink), trucks are Bachmann freight. GL stirrups, NBW's & Brake wheel/ratchet, Kadee #5's. The flat is scratch built using plans I developed. Frame mebers are walnut, deck is coffee sticks, stanchions for the hand rail are from an HO loco, tank straps are scratch, A&I and weathering powders. This looks to be an interesting month from the photos so far. Here are a couple of passenger car pics. This is a center door combine (aka Jim Crow car) kitbashed many years ago from a Labelle kit. The trucks are from Central Valley, when you could still buy them at the LHS. And here we have private car #100, also kitbashed from a LaBelle Business Car kit. While the combine has seats, this one is detailed very lavishly inside based on Robert Aaberg's RMC articles form the 70's. Good pictures to start the month everyone. Steve, those Labelle cars are beautiful. Any interior shots of the private car? Here is a photo of a Bowser X-31a double door auto boxcar I painted and lettered for the Wyoming Valley RR. The only modifications I made to it was to add Kadee #5s, P2K wheels and brake rigging from brass wire and spare Tichy brake parts. Thanks George, ask and ye shall receive. Here's the interior of the business car. Aaberg suggested using wood grained self stick shelf paper for the walls. It's OK, but I think actually pretty crude by today's standards. The furniture is mostly SS Ltd, which wass all that was avalable back then, as well as some scratch built pieces. The curtains are gros grain ribbon, which I still use for curtains in structures. The chef in the galley is by Preiser. Wow, we have an active day in this thread already! Drew, what do you have left to do on the flatcar? Tom, what is the story behind that photo. That boxcar has seen better days! Marty, that is a neat model. Nice example of scratchbuilding! Steve, those models are nice both inside and out. I haven't even begun collecting any passenger car kits. I need something of reasonable length (80 footers will not look good on my tight curves). Eric, did you have decals made up for that car, or did you print your own on an Alps printer? I haven't even begun collecting any passenger car kits. I need something of reasonable length (80 footers will not look good on my tight curves). Speaking of passengers, from deep in the heart of the Colorado Mountains comes this unique . . . well, you know what it is. Yet another piece of rail history preserved at Knott's Berry Farm. The herald I had custom made by Rail Graphics. The road name I ordered from Champions private name series. The dimensional data is from left over sets that I had lying around. This is a Tichy wheel flat. My only modification was to add complete brake piping. Nice job on the Tichy kit! Did it come with the load? Now what is the chances of two WV modelers coming together on the same Forum (unless it was a special interest site)? Chuck, where did you get your WV decals? Funny you should ask, Bruce. The same place as Eric. Rail Graphics. I designed the logo using EasyCAD years ago. The rest is Rail Graphics standard "Railroad Roman" printed with the logo. It really is funny to have two freelanced model railroads with the same name on this forum. Wow, the topic is not even two days old and I am losing track already. Great pictures and great rolling stock everyone! This is a scratchbuilt HOn3 "tool caboose" that I built about 5 years ago. It was based on a Julian Cavalier article and drawings that appeared in the Gazette in the early 90's. A string of cabooses ( cabeese ? ) 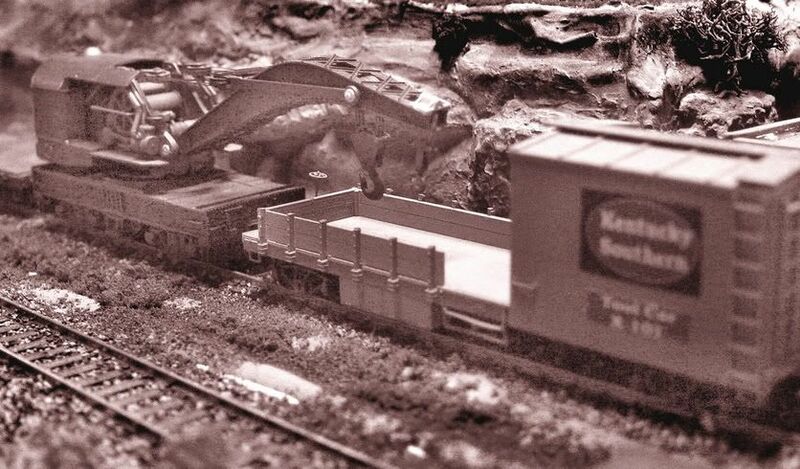 on our Windsor Modular Club layout ....not sure who built them but it wasn't me . ...the trees , well .....this is about rolling stock isn't it ? No , they weren't mine either . Terry & Mike, since you have posted some great caboose pics, I thought that I would add this one that I have shown some pics of before. It started life as an Athearn Blue Box Work Caboose Kit lettered for the ATSF. I stripped it, repainted and lettered it for the Susquehanna. I also added wire grabs, steps, a stripwood deck and side rails, and a few other detail parts. You can get the flat car, you can get the load, or you can get the carwith the load. See Walthers 2005 p.242. Geez , Bruce ...I really REALLY like the look of a transfer caboose , and I've never had one . I guess it's time ! The INTERCHANGE has been a great opportunity to see another's railcar up-close and personal. It has also been a great opportunity to run it with cars it will probably never see again. Since TomPM is the owner of this LNE boxcar, I'm gonna let him tell you about it. It is the first car on my layout that wears weathering and my other cars are sure envious. It looks great from any angle. Running Eastern Rolling Stock in the West! The caboose looks great! I remember following along when you did it. As far as the car goes it was one of my first custom paint and lettering jobs. The car started out as a undecorated Athearn 40’ boxcar. I painted it with Folk Art Barnyard Red and decaled it from a Walthers decal set. Prior to sending it into the Interchange I upgraded it by painting the undercarriage and changing the wheels from Proto 33” metal wheels to 36” metal. I changed the wheels because it needed the extra height to meet the Kadee coupler gauge. With the 33” wheels I had to use Kadee washers on the trucks but the car sat high and did not look right. I am slowly changing wheels on all my Athearn 40’ boxcars to fix this problem. The car was originally weathered by drybrushing and a wash. Before it left the RK&M I did some additional weathering with the airbrush. Here is a hopper that I recently made a coal load for. I also re-weathered it with the airbrush. Wow! these are all some stunning photos, guys! I still need to come up with some kind of a brake wheel for the car…I'm also going to letter it for the Ky Rock & Asphalt Co. Anybody know where I can get an O scale narrow gauge style brakewheel? Drew, Foothill has a new wheel that might work at http://home.inreach.com/jkitts/DetailPt.html#FMW4001 . An excellent scene, Chuck! [:-thumbu] The snow plow is a beauty! I especially like the "layering" of the buildings from foreground to background. It's a very realistic appearance! Here's one of the OVT&L's old water cars. It's been left on the siding next to the Osage Valley's machine shop. Nice photo! I love the urban scenery! Chuck that's one sharp looking boxcar. I like the color scheme, it reminds me of my college colors. If I modeled a more modern era, it's one that I'd use, too. Oddly enough, The TC&W is also towing its plow into the shops right now for the summer. What is the origin of your plow? I Don't recognize the kit, or is it scratchbuilt? Mine started out as the old Ambroid B&M plow kit which I modified and superdetailed. I believe that an HO model of this type of plow isn't currently available. Examples of the Ambroid (or Northeastern) kit are still easy to find on Ebay. Here's one of the OVT&L's old water cars. Better rust and lime cannot be modeled by man nor beast. That's a really nice picture of your plow; it looks like it recently came out of your fab shop, and spray booth. Modelling the East in the West! I've always been amazed by single truck cars and your's look so real. I was curious as to how the structure is mounted to the truck. It would seem to me that single truck cars would be susceptable to up-ending or turning-overs, especially tank cars. Guess this is more of a proto question? Here's one of the OVT&L's old water cars. It's been left on the siding next to the Osage Valley's machine shop. . . It is a Walthers kit that came out 8-10 years ago. They are no longer available. Tom, once again, nice weathering on that hopper. Mike, that's a little beauty! Drew, it is good to see both the Nantahala Midland and the K&I living on in photos. Chuck & Dave, the Green Mountain RR has one of those plows in their yard by the roundhouse in Walpole, NH. Unfortunately, the only picture that I took was from the car while driving by. I have the same plow that is about half finished. I got to the point where you assemble the wings and had so much trouble with them I just stopped. I guess the secret is to model them in the closed position and not open as I was trying to do. That's exactly what I did. They aren't worth the trouble to build them so they are operable, per the instructions. Another tip with this model...add more weight. I need to open mine back up and add more. It derails often since it is so light. Allen, I don't know how the prototype does it, but I suspect it's somewhat more involved than the 1-72 brass screw that I used. And a few more modern ones. Nice, Tom. I have a Hershey car that I need to put together, too. I have thoroughly enjoyed this month's gallery. The thing that really appeals to me is the variation of colors. Rolling stock really lets it all hang out. Thanks everyone for contributing; looks like I need to find a few of my own to post. You call those reefers? THIS is a reefer! Thanks Chuck for the tip about the extra weight. I just hope I still remember to add the weight when I get back to finishing the kit. 10/13/1984, Alleghany VA, ACMX 417 Allis Chalmers fish belly flat car used to transport hydro-electric equipment to a Virgina Power dam in Bath County, VA. George Willard photo. Do you know how well those cute little buggers track? Boy do I have a weakness for billboard reefers. Yours are very nicely weathered, too. Do you think that guy is wondering if they can move that car without it falling apart? BTW, does anyone make a model of that vintage wood sided truss bar reefer? Following up on the pictures posted by Chuck and Dave here is the prototype plow that is still used by the Alaska Railroad. I have the Walthers kit about half done somewhere in a box that still has not been unpacked from my move. Some day I hope to be able to post a picture of the model. Maybe sometime in 2006 Bruce in case you are watching we can have another rolling stock theme. . . .You call those reefers? THIS is a reefer! . . Here are a few of my billboard reefers. All are Athearn blue box kits. The only one that I have begun to weather is the Kraft reefer. Yowza! That thing is 60' long if it's an inch! Makes you wonder what were they thinking. Milk, which is mostly water, is VERY HEAVY! ...And probably turned into whipped cream after a long ride in this rickity thing. Bruce: I believe there WAS a kit of this car made years ago. In fact I think I got the pic from an auction photo of the instruction sheet. Now, the kicker is that I can't remember who made the kit. I've done a Google and Ebay search with no useful results. Anybody know? LaBelle, perhaps? TomPM: I recently read an article in "The Model Railroader" for September, 1940 by George Allen lamenting the demise of billboard reefers. Yeah, I'm that far behind in my reading! One fact in the article I found particularly interesting was that in an Autumn 1919 A.R.A. test a typical reefer going cross-country consumed 47.2 pounds of ice per hour. Bruce, since I currently have only about 20' (total) of track wired, the work train cars don't get run often - or far. The one-truck cars seem to track okay over that little bit, but it really isn't much of a test. Here are a few more of my cars. The RPO is a Walters Trainline (aka Rivarossi) model that I painted and lettered. Modifications include vents and window glazing from Bethlehem Car Works, body mounted Kadee #58 couplers and I replaced the brake handles with brake wheels and chains I had in the spare parts box. I also painted the interior, added three mail clerks and even some mail. Since a lot of pictures of reefers and milk cars have been posted, I'll post a couple, too. This is a milk car of unknown manufacturer. It belonged to a former member of my club and I bought it after he died. I repainted it, replaced the roof walk with one from American Model Builders and added stirrup steps I made from staples. This is a Branchline reefer that I repainted. Eric, nice reefers, and I love the Express truck meeting the RPO! Here is one of my oldest pieces of rolling stock. It is a Varney tank car. The only recent upgrade are the couplers. Normally I just lurk on these threads and gain from the experience and talent, but I have something to share for a change. This is my first weather/bash project. I removed the roof walk cut down the ladders and lowered the brake wheel assembly to represent this car as it could be seen late in it's lifespan. It's an Atlas O model. The tank car looks great! Nice looking RPO and reefers! Looks like everyone is happy with the topic this month . Nice job on both the modifications and the weathering. Thanks for posting the picture. I am also a fan of MOW equipment. Here is a somewhat smaller crane that often sits in the small yard near the port in Morehead City, NC. Remember this one? It was from when I was making my eChristmas card. Tom, I indeed do remember that beauty. Here are two smaller cranes. The first is a tie crane operated by MetroNorth RR. This one sits on top of gondolas and lifts ties out while the train stops along the ROW. This is operated by New Jersey Transit. Here's one of the OVT&L's ballast cars waiting for pickup. Thanks for the kind words. It's a start! Learning from everyone here. Great job on the weathering! That is a cool looking car! OK here are some more work train photos! Those have to be some terrific pictures; wish I could get mine focused as clear as you do. Thanks for sharing. I especially enjoyed your weathering of the tank car and the wrecking cranes are one of my favorites. From the soggy West as in domicile! OK here are some more work train photos! . .
Jon, that is some nice weathering, thanks for posting. Mike, are we allowed to use the adjective "cute" to describe rolling stock? That is a cute neat little ballast car. Tom, that is a great sequence of pictures! Great work and shots everyone! Here are a few more photos. None of MOW cars (alas, I don't have any yet). This is an Accurail stock car that I added Westerfield solid doors, Tichy KC brake and brake wheel, scratch-built straight center sill, Accurail Andrews trucks, and Kadee No. 5 couplers and wheels. This is a Bowser GS gondola that I painted and lettered for the Wyoming Valley. Modifications include Walters arch bar trucks with NWSL wheels, Tichy KD brake and Kadee No. 5 couplers. This is an Atlas 36' meat reefer decorated for Cudahy and Old Dutch Cleanser. This is a great little car and truly as ready-to-run as any car on the market. All I added were Kadee No. 58 couplers and some light weathering. This an old AHM/Roco reefer that I got when I was in high school (30 years ago). I have owned this car longer than any other, except one. I gave it to my younger son (I purchased the Branchline kit in the same scheme) and it still sees regular duty on my club's layout. I added body-mounted Kadee No. 5 couplers, Accurail trucks, Kadee wheels and some additional weight. Correct me if I'm wrong, but I don't think N&W had very many stock cars. I think that is the first one I've seen modelled. Who is its manufacturer? Great work and shots everyone! Here are a few more photos. None of MOW cars (alas, I don't have any yet). . .
Eric, thanks for posting the pics of those great models and for describing both their origns and your modifications. Dave, that is a great closeup of an outside braced boxcar. Here is a picture of a woodchip gondola that is no longer "rolling". I came across this wrecked car in Warwick, New York this winter. It is on the old Lehigh & New England line, now operated by the Susquehanna. They were using the gondola to transport construction debris. Either they had it overloaded, or the car was getting old, or both. It just broke apart here. Interesting, this line is right next to a road, so the carted the junk away by truck, and used a truck based crane to move the car off the tracks. The only things that they are likely to salvage are the trucks. This sat there for several weeks. I really like those billboard reefers, Eric! Bruce, I was looking at the rust on the bulkheads and the trucks/wheels. Both the color and the texture make a great study for weathering. Here's the OVT&L's blacksmith car. A small gon loaded with stovewood trails behind. Correct me if I'm wrong, but I don't think N&W had very many stock cars. I think that is the first one I've seen modeled. Who is its manufacturer? I can't attest to the quantity of stock cars that the Norfolk and Western had, but they did have some and Accurail did make the model with a correct number. In this case the 29000 series was rebuilt by N & W from boxcars in 1935. As rebuilt, they used the original boxcar doors, hence the solid doors. They also had Andrews trucks, KC brakes and straight center sills. I made the modifications to the Accurail model based on a prototype photo I found on the New England, Berkshire and Western Model Railroad web site. This is a Tichy model of a rebuilt box car that I'm using to model older, rebuilt rolling stock. Cars such as these may have been 'war emergency' composite cars or outside braced wood cars from the '20s or '30s. If the underframes and steel ends were structurally sound, they could be rebuilt with upgrades such as newer trucks, 'AB' brake system, newer doors, new roof, grabs, ladders, and steel sheathing. The Plano roof walk has to have the buckle taken out, some grabs added to the roof end walks, a little cleaning up, and it'll be ready for the paint shop. These photos are from my [:-love]'s new Canon A95 Powershot. It doesn't do close-ups very well, so a separate close-up lens will have to be put on the wish list. The camera may just be too close to the subject to focus properly. I try to back off the subject at least 18 inches and use the optical zoom if needed. Just a thought. The car work looks very nice. Thanks, Dave..I'm still trying to get used to this camera. I really like the rebuilts and war emergency cars...they have alot of character. I'm thinking in terms of a two-tone paint scheme...dark blue bottom 1/2 and medium grey upper 1/2. It'll go into the spraybooth this weekend. These photos are from my [:-love]'s new Canon A95 Powershot. It doesn't do close-ups very well, so a separate close-up lens will have to be put on the wish list. I've posted this tip before but maybe this might be of help to those of us with lame digital cameras. First: Put your camera on a tripod and get as close to your subject as you can while keeping it in sharp focus. Last Saturday, on the way to the current well, I passed two interesting sights. The first is a gon being loaded with salt at United Salt mine near Carlsbad, NM. The front end loader operator can actually say he has been "slaving at the salt mines". The second is a photo of a gondola/hopperloaded with potash on a spur headed to the main line at Carlsbad. What I thought interesting is that Southwestern Railroad still use a caboose. I thought I had better explain. Even though the rolling stock is lettered ATSF, they are being operated by a local short line, the Southwestern Railroad. This RR operates from the mainline to the mines in and around Carlsbad. Russ, is there a basic tutorial on undercarriage piping available? When we visited Ira, he mentioned using the carbuilders encyclopedia drawings, but I would think that most modelers don't use that resource. Jim, those are two commodities that we don't see on the rails in the Northeast. I wonder how many shortlines still use a caboose on their trains? I've been wanting the Bachmann 250 Ton Crane and Boom Tender for a while and after seeing Tom's nicely weathered unit , I decided to buy . This is obviously untouched and right out of the box , in action on the Modular Club layout . Next is my gon with the scrap metal load ...really just pencil sharpener shavings painted silver and rust .It's on a siding near J.Bagley & Sons Manufacturing on my home layout . Great pics , everyone ! Terry, I've been looking for a crane car as well. I had a kit from Red Ball in my hands last Saturday, but decided against it (with input from Dave and Chuck). Maybe I will go for the Tichy kit -- maybe. I'm looking for a smaller crane than the Bachman kit. Love that pencil shaving gondola load. Nice looking crane and tender! Cool job n the gondola and the load. I love the various methods that are used to model things. I have to try your pencil shavings method. Think about the Tichy kit crane and tender are both very nice models. The crane looks like an aweful lot of work but the instructions break it down in very logical, small steps that result in a very fine model. Both kits go together beautifully, all holes are pre-drilled and everything fits! I've never gotten around to filling up the flatcar end with "stuff" yet. There is a diagram included in the Tichy AB brake detail set originally drawn and published in 'Mainline Modeler'. That's the one that I follow. I have some air brake books at home and I'll post diagrams, appropriate text, etc. when I get our new computer next week. That Tichy kit looks awesome ...I've never seen it for sale in a shop , or even at a vendor / train show . The pencil shavings / scrap metal was an idea that Dean Freytag gave me . Dean is one of the best scroungers I've ever seen . In fact there is an annual ' Dean Freytag Award ' at the Steel Modellers Meet for the person who shows or displays the best ' use of junk ' in his modelling .Shelby Corbin won it last year . Great modeling & photos everyone! This car started out as one of those Bachman “old time” freight cars. Anyway, here’s how it turned out. Drew, that is a great transformation! I pass the Suffern, NY yard that NS uses on my way to work each day. Usually, there are mainly covered hoppers with a smattering of tank cars and a few boxcars in the yard. Every once in a while, something catches my eye. PS -BTW Terry, . .Are you going to convert your crane from steam to diesel? I've been wanting the Bachmann 250 Ton Crane and Boom Tender for a while and after seeing Tom's nicely weathered unit , I decided to buy. . . I'll be keeping mine steam , Allen . The crane and work caboose will need a lot of weathering to make them look right . Here are some more pictures of the Susie-Q Boxcar. I tried looking on the bottom of the car, but there were no identifying marks. Maybe someone will know who the manufacturer is after taking a look at the pictures of the bottom. That is it, Ok. Nice job. Actually, when you think of what they use that crane for, it was a good way to approach it. That is a distinctive underframe, but I don't recognize it. Wow this month's gallery has taken off. So many great pieces of rolling stock. How about a little change of pace? We'll call it the pink invasion. This boxcar is the OVT&L's most recent acquisition. It was pressed into service right away, so it's still lettered for its former owner, the Deer Creek Land and Timber Co.
Actually, this is the last car I built for my OVT&L work train. I have several more I plan to build using white metal car frames from Rusty Stumps. I decided to take a break from building rolling stock, however, and haven't done any more since the boxcar. Is the theme of that train "Pretty in Pink?" My daughter would find it very appealing. On the other hand, my sons would dismiss it as a "girl's train." When I officially got back into modeling the first two kits I got were the Ralston-Jefferson hopper, and the Klemme Co-op hopper. They were selected by my daughter. I have one each of Farnhamville, Albert City, and Ralston-Jefferson hoppers in various stages of assembly or weathering on the work bench. I also have an undecorated one that will be a Ralston-Jefferson hopper. 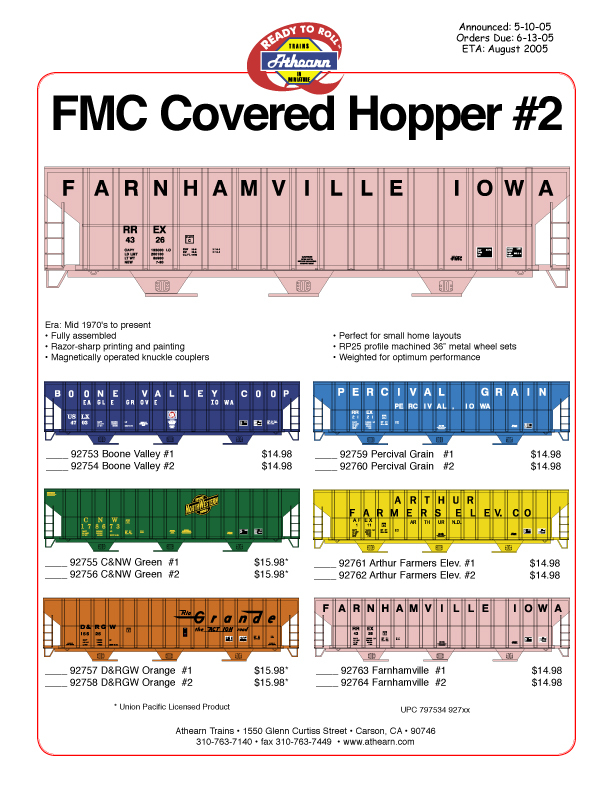 Now Athearn is releasing Farnhamville hoppers in their RTR line. Another one for the wishlist. Great looking boxcar you snuck in there! Another nice sequence of pictures. Lately, there have been a number of CO-OP hoppers in the Suffern, NY yard. It is just getting harder and harder to find a place to take pictures without getting questioned. Mike, was that boxcar a kit? This Sperry car was on a siding in Suffern, NY for over a month this winter. The TC&W shops decided to add a generator behind the stack and a headlight in front of it. The Tichy kit is not for beginners, but is just plain BIG and delicate. The instructions are quite good. The only quarrel I have with the kit is that the cables are supposed to operate, but using the thread I was supplied with at least it ain't gonna happen. I knew my work was only half done and I would have to scratchbuild a crane tender! I'm going to stop here for the benefit of you dial-up Guys and Gals. Never fear, I'll be right back with the saga of the crane tender. Hoppers, Sperry Cars, and Cranes, . .it doesn't get any better than that. This has been a great month for our gallery! Thanks everyone for posting those neat pictures. My Thorn Creek and Western is an imaginary short line which theoretically existed in West Virginia in 1942. . .
Nice job on the Tichy crane. I am looking forward to some pictures of the crane tender. Here is a prototype photo of that Susie-Q car. It's 7 AM here in Portlandland with a little drizzle (Where is that drenching the weather weenies said we were gonna get?) and I'm gettin' ready to meander off to church from our hotel. Thanks for the proto picture of Miss Susie-Q. If you have a higher resolution one, would you e-mail me the file? We are going to stop on the way home from church, and I am gonna have some roast duck. Maybe that will perk me up before arriving home. Got to walk fer now! . . .Here is a prototype photo of that Susie-Q car. . . Cool pictures of the Sperry car and Susie-Q car. Great pictures of the crane! Here are my newest additions thanks to EBay.They are all Athearn 50' flat cars with twin trailers. This one needs a brake wheel. I need to repair the coupler box and cover. Also change the couplers over to Kadees. And then there is weathering. These guys need some weathering and a few small upgrades. I tried especially hard to duplicate the chains draped along the sides. The uprights and slats were fabricated from styrene. The wood crate was frabicated from styrene. The parts inside are leftovers from the crane kit. I always like your scenes and backdrops. They seem to get a lot of mileage. Good scenes do just that. I was wondering if that is an elk or horse partly showing above the train? . . .Here are my newest additions thanks to EBay.They are all Athearn 50' flat cars with twin trailers. . . I second Bruce's comment, a terrific job. [:-thumbu] You certainly put a lot of thought and work into your BROWNHOIST and its tender. Here are some pictures of a slab (wood block) car. Used to haul mill scraps and waste for use in donkey engines and camp stoves. Freelanced, but based heavily on a photo of a Diamond and Caldor car found in Mal Ferrell’s 1990 book on this line (page 143). 23’ long. Plan drawn with AutoCad. Uses Grandt Line hardware and NBW’s, brass wire truss rods, and Russ Simpson trucks and couplers. Brake rigging made from Grandt Line shoes, and scratchbuilt hangers. Foothill Model Works now has superb brake rigging parts that save a lot of time and look great. Wish they were made back then! For the wood parts, I used Weather-it as an undercoat, and then I wiped Floquil Boxcar Red on each board before assembly. Some truss rods, steps and grab irons were bent up to simulate hard usage. Debris made from bottlebrush tree twigs, bark and sawdust, glued over diluted white glue. One of my first ¼” scale cars. Here are some pictures of a slab (wood block) car. That is one damm fine piece of modelling. Thanks, Phil. Bruce, sorry for the big pictures! My software allows me to resize to under 80K, but it doesn't tell me the dimensions. Let me know if I need to fix these. That car is a model!? Awesome! That is some impressive modeling! I will resize the pictures tonight unless Mike gets to it first. Here are a couple of my favorite rolling stock. Not long ago, I latched on to these fire-fighting cars from Georgia Pacific for my N&W Maintenance of Way train. I changed the number on one of them (noticeable) and spruced them up with some detail paint. I have yet to find the boxes they came in, so maybe someone can help me out as far as who manufactured them. Larger scale narrow gauge cars are really great to work on. This Grandt Line kit came with a warped floor and roof so I decided to work with it and incorporate the look into the rest of the car. I scored 'n chewed up the ends of the floor boards at the door to simulate typical hoof wear at that point. I weathered the car using pastel chalks worked into the flat lacquer coating and washed down a bit with alcohol and water. I have yet to find the boxes they came in, so maybe someone can help me out as far as who manufactured them. Allen, those are made by Walthers and are part of their "Trainline" series. This little OVT&L gon is loaded with firewood for the blacksmith's car. Mike, where does the firewood end and the car begin? I am liking your little car. Is that Brennan's Ballast I see? Good looking model. Who are the trucks by? Mic, that's a mix of Highball limestone and granite ballast around some plain ol' Atlas code 100 flextrack. To answer Allen's question: The animal is a deer. You can see one of his friends at the end of the next series of pictures. If you model the Anthracite Roads you have to move coal. If you have coal then you need hoppers! Mike, I feel compelled to use the "c" word again to describe the little gon. Very nice modeling! This classic covered hopper was sitting in the Suffern, NY yard yesterday. I always enjoy seeing a remnant from a fallen flag. I have always liked the D&H herald. The trucks are Russ Simpson 3'-7" Westside items (I think still available). On the first versions, he supplied brass spring stock to be cut and installed individually. I liked seeing light through the springs. He later change to castings (yuk). I mostly scratched the brakes from wood and styrene with GL shoes. I would use Foothill Model Works version today. Bruce, if you enjoy seeing fallen flag remnants, you'd be in 7th heaven around here! Only in our case, it's more like "gobbled up" flags along the UP's mainline... SP, MoPac.... you name it and it's in one train or another. I know some of you have seen this photo umpteen times already, but it's one of my personal favorites. So here it is again. I feel a bit out in the weeds because of my home computer failure and I haven't been able to post photos of some of my recent projects. In the spirit of Mike's post, here's another Grandt Line On3 kit that I put together. There's also an interior kit that was/is available for it, but I really built this for shelf display. I used the same weathering process on it as the C&S stock car making certain that the windows were prototypically filthy. Unfortunately, the standard black disc C&S herald decals with the white circular outline and white letters fell apart while experimenting with the weathering. The lettering here is the old style C&S lettering. I also have a Gramps On3 frameless tank car that I'll post when I get the new 'puter up and operating over the weekend. That combination of spilled oil and rust makes it one of my favorites also. That is a neat little caboose. I hope that you get your computer set up so we can see more of your rolling stock. Mike, . .I think it's my second time; the little person on the car was a give-a-way. Wonder if he is permanently secured? This picture along with the one of your train/ trestle above the water are my favorites too. I know some of you have seen this photo umpteen times already, . .
A friend, Huh? . .I was wonderin' if you had move him since the last shot? Or if he was grazing down-hill? This one seems to be at a lower elevation than the one in the first shot. . . .To answer Allen's question: The animal is a deer. You can see one of his friends at the end of the next series of pictures. . . I came across this MOW crane and tender flatcar about a year ago, in Flemington, NJ. It belongs to the Black River & Western, RR. Here, a year later, you can see that the weeds and vines are taking over. I have a few closeups to post after I crop them. Here are some of those closeups. The vines on the boom look like wild climatis, a weed we battled for years in the Portland Metro area on the highway right-of-way. Your crane and tender would make an interesting subject to model. Here are some of those closeups. . . Since it's Saturday evening, I thought a picture of a beer car was appropriate. It's an Athern reefer with Clover House dry transfers. Old Frothingslosh was a brand created by Rege Cordic, who had a morning wake up show on the radio in Pittsburgh when I was growing up. He was not only a very talented radio personality, he was also a pretty fair model railroader. That is one nice lookin' car George. Since it's Saturday evening, I thought a picture of a beer car was appropriate. . .
That's a great car, George. I love the "foam is on the bottom" line. George, what could be better -- a billboard reefer advertising beer! I have seen the ads for Clover House Dry Transfers, but haven't tried any of them. Are they easy to work with? I've had a little experience with dry transfer letters before I tried the car so I didn't have any trouble with it. It really isn't all that difficult. I think that decals are easier to position because you aren't trying to see through the backing paper. That is unless it's a large piece like the white foam on the car. Then the transfer is easier since you don't have to deal with wrinkling when you try to put it in position. You have to be careful that you rub all the transfer - any part you miss will not be released from the backing paper. Fastening the transfer with masking tape at the top to act as a hinge helps correct this problem. If you miss something, flip the transfer back down and it should remain in alignment so you can burnish the offending spot. Here are photos of a couple more pieces of my rolling stock. I've posted a shot of this caboose before. It is an MDC/Roundhouse model that I originally painted and lettered for the ATSF back in the early 90s. At that time, I replaced the kit tools boxes with ones I scratch built from strip and sheet styrene. I also replaced the thread with fishing line for the trust rods, added window glazing made from clear sheet styrene, Kadee #5 couplers and Kadee wheels. Last year, I repainted it for the Wyoming Valley. I also replaced the original arch bar trucks with P2K Andrews trucks, added Tichy corner grab irons to the cupola roof, Tichy brake wheels and a Gloorcraft smoke stack. This is my latest acquisition. It's a Proto 1000 36' Fowler boxcar. So far, I've only added Kadee #58 couplers and painted the wheels. I plan on replacing the ACF trucks with arch bar trucks and weathering it. That caboose came great. It is amazing what a difference some added detail makes! I'm just getting caught up with this thread after having been gone most of the weekend. Some more really good photos of some very interesting cars have been added since last week. And thanks for the compliments, everyone. Before the gallery closes out, I thought I'd include a couple more pics of the passenger car variety of rolling stock, uniquely Southern version. Here's a classic "Mixed Train Daily" on the Louisville & Wadley RR circa 1954. The loco is a classic Bachmann, er, Baldwin 4-6-0 , followed by a GM&O boxcar, and trailed by a steel Harriman style center door combine. This is big time short line railroading at its best! This is my representation of the combine, kitbashed from an Athearn round roof coach and clerestory bagage car, and lettered for my Georgia Southern RR. It's not exact but gets the effect across. BTW, the church in the background is a 3/4 scale scratchbuilt modelof the Campbell Iowa School House (currently at Knotts Berry Farm), which I kitbashed into a church. Dutchman and Chuck, thanks for the compliments. Excellent job on the combine. I agree that your combine captures the essence of the prototype car. Nice job! Since this is the last day for this thread, I thought I'd post a couple of additional photos. This is a Bowser H21 70 ton hopper, that I back dated by replacing the AB brake with a Tichy KD brake and replacing the molded grab irons on the ends and the lower ladders on the sides with wire grab irons. I also added Jaybee wheels, additional weight and an a CM Car Shops coal load. This is an Accurail USRA 55 ton hopper. I replaced the AB brake with a Tichy KD brake, Intermountain wheels, additional weight and a CM Car Shops coal load. its time to show my latest piece of Fn3 (1:20.3) rolling stock. Its entirely scratchbuilt (except the wheels of course)from plans out of the Gazette. I made a prototype from styrene and then silicone molds for each part. So I can duplicate the logging truck later. What you see on the pics is one of those resin-copies. Mj and Jens - both your efforts are great. Jens I am wondering how you broke down the parts for casting. For example the, the bearing frames (I am making an assumption about what to call them) with the LEW embossed on them: are they separate resin castings as well? What is the their thinkness (to help me with a better idea of scale)? I really think the over all look is great. Mj - what materials did you use? Thanks for those posts. Jens and Marty, those scratchbuilt disconnects look great! Very nice disconnects, Jens and Marty! I never knew a bar was used to connect pairs of these. I always thought the load served as the connection. Eric, Nice hoppers. You can never have anough of those in the Wyoming Valley! It's been a great month of photos everyone. I haven't had much of a chance for posting this month but here is one just before the bell goes. Well, May has come and gone, andit is time to close this month's Photo Gallery. I want to thank all who posted the great photos of rolling stock this month, and all who either visited the Gallery or responded to the posts. Thanks also to Mike for suggesting this month's theme. It was a good one. © 2000-19 Railroad Line Co.